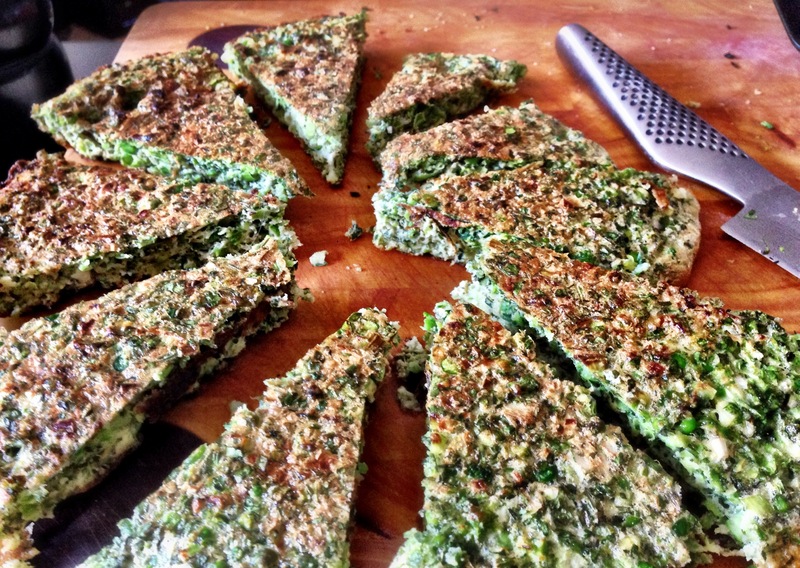 Funny name for this granted – its kind of an omelette, kind of a frittata. I knocked this up on Monday when Freya said she was hungry and it was way too late to eat. The cupboards were pretty bare but I knew I had the ingredients for this and it was very quick and easy to make. I’m not convinced the recipe in the book is the smartest way to make this. Basically, you fry some herbs in butter/oil and after a short while you pour a batter of eggs, flour and baking powder over the top and cook on low for 10 mins until the eggs set. The problem with this is the herbs will burn. They get trapped under the eggs – get all the direct heat and lose all their flavour and don’t look at all appetising. The herbs lost a lot of their flavour too. That was a much better solution as the herbs retained their flavour and nothing looked burnt. For added awesomeness – add cubes feta cheese – that really does make an awesome snack. Gee it seems like ages since I made anything. But it has only been a couple of days. We’ve been under a lot of pressure to get the boat finished and have basically been eating shop bought dips and cheese and bread for 5 days while we put in lots of hours sanding and painting – desperately trying to get it finished before we move it next Saturday. That said – there were some ingredients in the fridge that needed using up – and there were still three recipes left to make from Veggiestan – so I made this. Just in case you’re wondering, Arak is an anise-flavored distilled alcoholic beverage traditional to Lebanon, Iraq and other Middle Eastern countries. Ouzo, Pernod, Rakir are acceptable substitutes. I have Rakir and Pernod – but for my soup I used Pernod as I figured it had more of an aniseed taste. I don’t usually make soups – especially when the weather in the UK has been pretty good and salad inducing. I leave soups to my mother-in-law. She has a Thermomix (which I bought her a year ago) and this makes amazing soup with next to no mess – so generally soups are left to her. This one caught my eye simply because it contained alcohol. It’s trivial to make this. 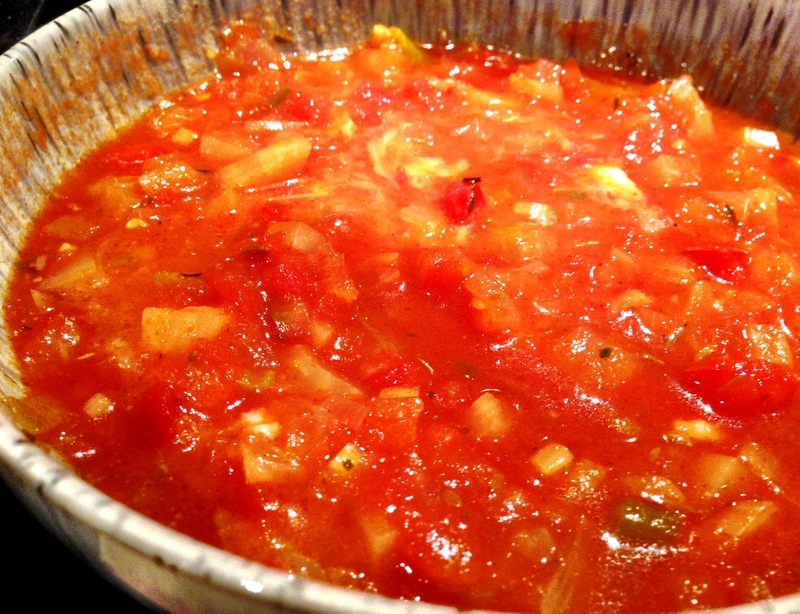 Chop some red peppers, fennel, tomatoes, onions, garlic and soften. Add some stock, spices and alcohol and simmer until it’s done. This is really chunky and really tasty. Fennel is an amazing vegetable and people just don’t use it enough. I stirred in some creme fraiche at the end and I think it spoiled it a bit – so the second bowl I left it out and it was much better. The ingredients for this recipe are often left over after a weeks cooking – so I think I’d probably contemplate making this each time – it took less than an hour – and I imagine it’ll keep quite well. It might even be good cold as a kind of Gazpacho. This very simple recipe takes very little preparation at all – as long as your tomatoes are ripe. Hollowing out unripe tomatoes isn’t the best of fun – especially those really big ones that you need for this dish. It’s a shame I invested the time in making these. I made these over the road at my mother-in-laws to keep her company and completely forgot that I’d left half a kilo of Fava Beans simmering in a pan in our cottage. Suffice to say they got a bit burnt once the water had all boiled away! Oh well! They look ok – maybe they’ll be ok – we shall see! Anyway – back to the tomatoes. Once your tomatoes are hollowed you chop the contents of the tomato and add to some cooked onions. 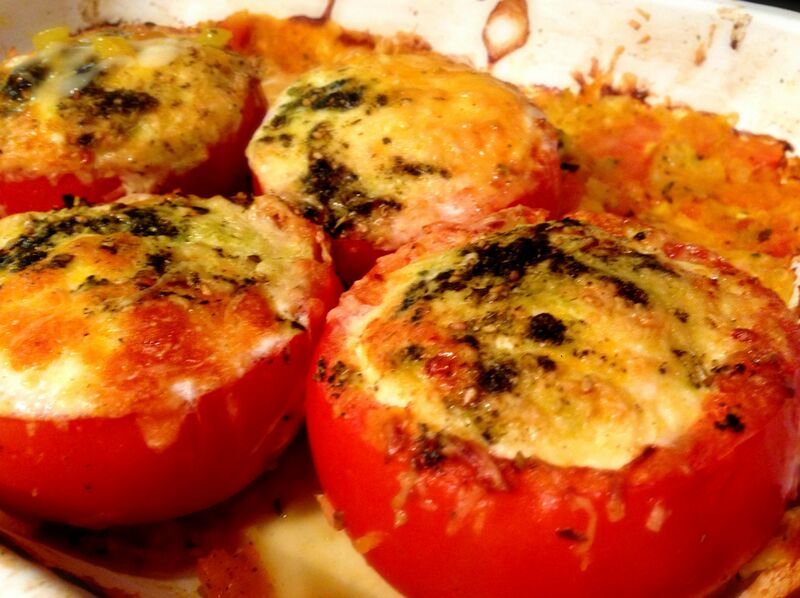 After spooning a little of this mixture back in the tomato you crack in an egg and top with grated cheese. The remaining mixture is spooned over some toasted pita breads – put the egg filled tomatoes on top and cook in the oven until the egg is firm. This isn’t the most elegant of dishes and if I’m honest I’d probably change a few things. There needs to be more flavour somewhere – maybe with some fresh thyme or basil in the tomato mix, not sure yet. Also I’d drain off as much of the juice from the tomato filling as it was a bit too wet when you cut into it. Or you could reduce the liquid from the tomato juice to make the flavours more intense. That said it was ok – and easy. Having the tomato on a bed of pita bread made the dish more complete. It would probably look quite fancy alongside some sausage and bacon in an all day breakfast! If you ate meat that was! Maybe I’ve just gotten used to making something slightly more zingy and tasty and different. There are better dishes than this in Veggiestan. There are worse too – remember the fried eggs and dates! I don’t usually make this sort of thing as I’m not a big fan of shallow frying things in lots of oil. They just can’t be healthy. That said they caught my eye so I thought I’d give them a go. 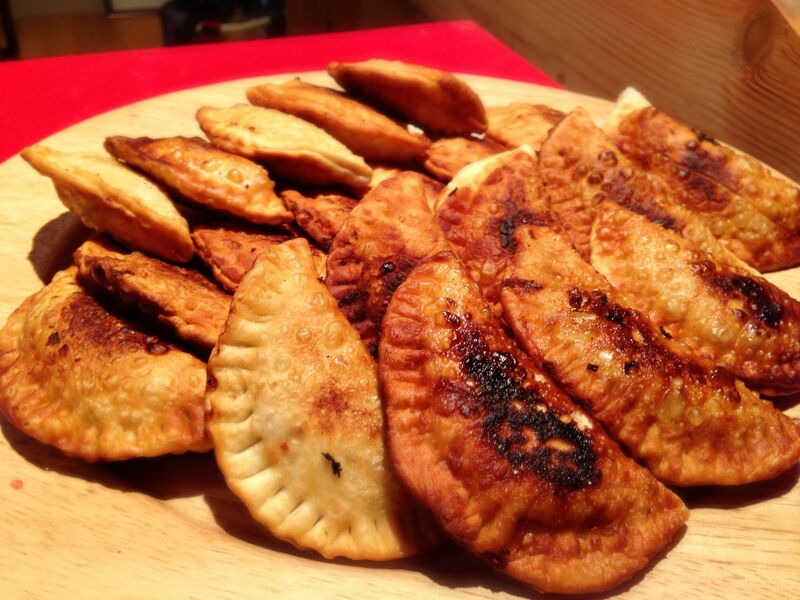 These are pretty simple to prepare – but take quite some time to fry. I think the proportions are all off in the recipe too as I have over half the filling left over after using up all the pastry! This is basically a flour, salt and water dough – cut into thin circles (I used a cocktail shaker which had a handy 9cm diameter !) and filled with a mixture of mashed potato, leeks and spices. The recipe says you’ll make 20 but I made nearly 40! They are quite nice and we tried them with an assortment of dips from Creme Fraiche to Ketchup to Garlic Jam (from the Isle of Wight Garlic Farm). I think keeping it simple with something like yoghurt or creme fraiche is best. Ketchup overpowered them even though they were quite spicy. There is clearly a lot you could change here – any filling would probably work as long as it was quite solid. It wasn’t the best choice of dinner as these are really better placed in a buffet or in the middle of the table in a meeting at work (that’s where the 30 left over ones are going). Eating five each was enough – and we usually eat much lighter food than this. That said – if these were in front of you and you were distracted with a good film – or like we were with the first episode of Season 4 of Game of Thrones – then you might just munch your way through all of them without realising it. I had another one of these before going to bed (just like Nigella might) and they weren’t as crisp as they were when they were freshly fried – but the recipe does say they keep well – so we’ll see tomorrow. Another late dinner for us. – way past 9pm. And there was a choice. 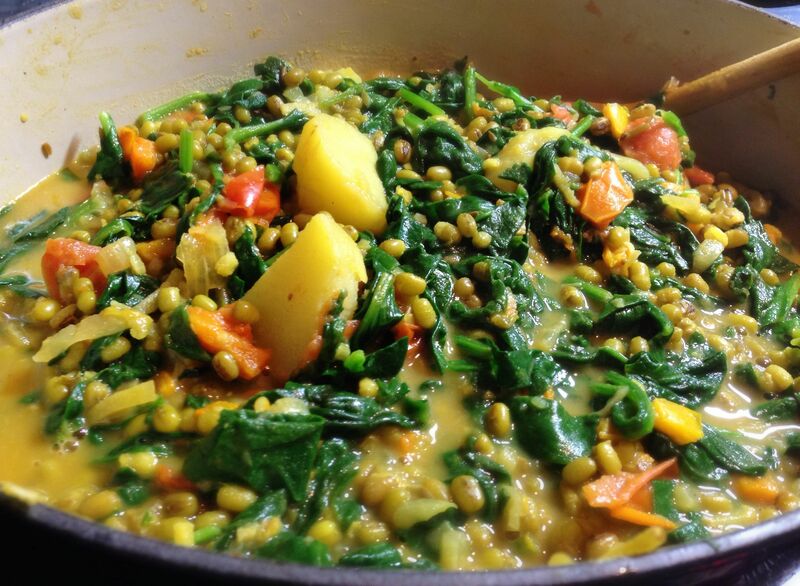 More Mung Bean Casserole (see previous post) or something else. Something else won the coin toss. This is another dish from Veggiestan by Sally Butcher. Once I’ve made more than half a dozen things from a book and liked them I can safely recommend the book. Apart from the shocker that was Figs and Fried Eggs, everything else has been awesome – and there’s still half a dozen things I haven’t made yet. The keen eyes amongst you will realise as I did that this dish could have been called anything – there are a lot of ingredients in this dish other than the two in the title. Pretty much every ingredient in this dish is in equal proportion. 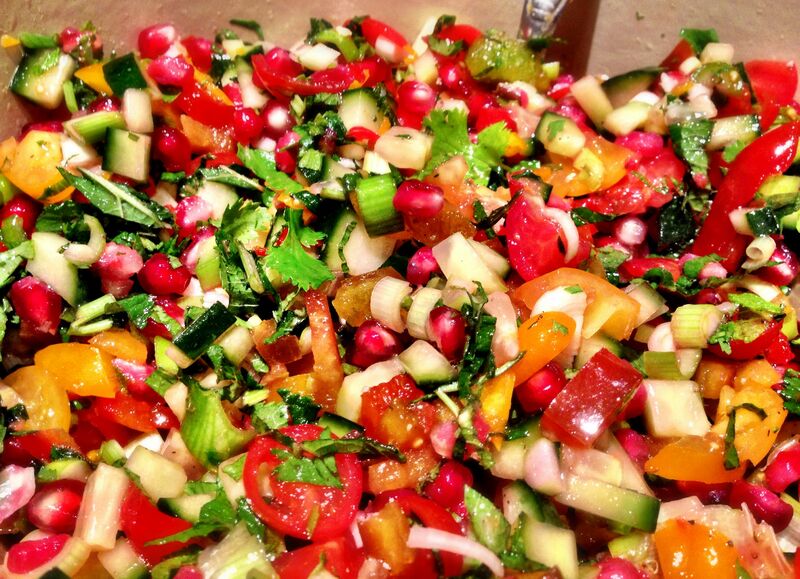 Pomegranate, cucumber, tomato, peppers, spring onions, mint, coriander – lots of very fresh ingredients. There is also a hot chilli pepper to give it some kick. I added a Scotch Bonnet. There’s even more zinginess from the juice of some limes. This recipe is in the Meze section of the book and is supposed to be part of many other dishes. We had it on its own as it was getting late and I realised I had missing ingredients for the other things I wanted to make. It is very enjoyable on its own anyway. 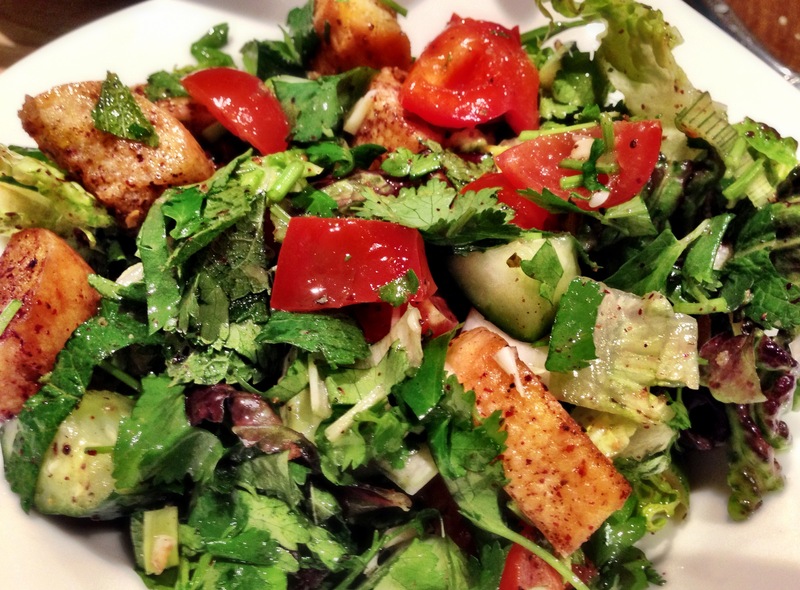 I never feel bad eating salad late at night – it’s hardly going to pile on the pounds. In any case we can dance it off tomorrow night when we go Rock’n’Roll dancing! There are some days when you just can’t be bothered. Today is one of those days. In fairness the reason I can’t be bothered is I took the day off work to sand and paint the outside of our boat and it has been raining since yesterday evening. You can’t really sand in the rain. Electricity and water don’t mix particularly well. Even if it stops raining, the sanding disks just clog up with damp paint so it’s a fruitless task. So. Eleven I clock came round and I figured I should make something for lunch and just hope that the rain goes away. I wanted something warm – salad wouldn’t cut it this time. The mung beans I ordered from souschef.co.uk arrived at the weekend so this seemed like the most appropriate Winter warmer to make for such a wet day. This is a one pot affair. Just make sure you have a big one. A lot goes into the pot. After frying off the vegetables and spices and chillis, you add the mung beans, potatoes and capsicum peppers and simmer until the beans are done. You then add an inconceivable amount of spinach, tomatoes and lime juice and it’s done. It’s pretty easy and it tastes so good. It makes ever such a lot. I reckon we will be eating this for a while. It has a lovely warming flavour but it isn’t spicy even if it does have a Scotch Bonnet chilli within. This is the best thing I’ve made from Veggiestan so far. I really like thing kind of ‘curry’. It’s not really a curry but it could easily pass one. The recipe suggests you might want to eat it with rice but I can’t see why you’d want to have it with anything. It’s a meal all by itself. Well it seems to have stopped raining so off I go to the boat!